Concorde Battery Corporation has hand crafted safe and reliable batteries in West Covina, California for over 40 years. The company got its start by successfully building a dry charged (wet) lead acid battery for the military that exceeded the life cycle specification, a feat that other manufacturers could not achieve. In the 1980�s, Concorde designed an efficient and reliable pressure relief valve. This, combined with proprietary manufacturing processes developed by Concorde resulted in the high performance and highly reliable sealed valve regulated lead acid (VRLA), absorbed glass mat RG® battery. Sealed lead acid technology, sometimes referred to Sealed Lead Acid Batteries (SLAB), has become the preferred technology for general aviation thanks to their safe, maintenance free and reliable characteristics. Valve Regulated Sealed Lead Acid (VRSLA) batteries offer a number of benefits over dry charged construction. No fluid monitoring, no acid spray in flight, no potential of acid spillage. Plate size is maximized because there is no mud rest. The additional surface area results in increased battery capacity. Concorde�s reputation as the premier sealed lead acid battery is the result of a team of dedicated engineers that have advanced SLAB technology by incorporating characteristics and processes that improve life and starting performance of Concorde RG® series batteries. RG® batteries have lower internal resistance thanks to thick over the partition intercell connections. These connections increase outrush (or high rate) current and charging abilities. Our proprietary Polyguard® Separator system envelops the positive plate of a RG® battery. The separator increases compression, reduces internal resistance and provides an extra barrier that prevents shorts when exposed to shock and vibration. The end result is a robust, high performing battery that has been touted by operators as the best in the aviation community. Concorde batteries are handcrafted by highly skilled craftsmen in West Covina, California. Additional steps, unique to Concorde, are taken throughout the manufacturing process that result in optimized battery performance. Concorde batteries are fully formed on charge. Each battery is subjected to a high rate (simulated engine start) and C1 capacity test prior shipment. Batteries are not judged on a bell curve; each battery must meet a minimum of 100% capacity to be shipped. Concorde STC SA01118WI is available free of charge from Concorde Battery Corporation and covers the installation of Concorde RG® batteries on Cessna 177, 177A, 177B and 177RG aircraft. Concorde�s STC provides simple instructions to modify the battery box on 12-volt aircraft with plastic battery box covers. The modification allows for proper fitment of the RG-35A and RG-35AXC batteries. CFO Aviation parts experts and CFO supporter, Wilco, Inc. also holds a STC to install Concorde batteries on Cardinal models (SA00897WI). Wilco will provide the STC free of charge with a battery purchase. The installation may also be approved by your local ACO using FAA Advisory Circular 23-27, PARTS AND MATERIALS FOR VINTAGE AIRCRAFT. *Concorde STC is in process of being updated to include Cessna part numbers 0511319-201 and 0712605-201. To purchase Concorde batteries contact CFO sponsor visit Wilco. Wilco offers a CFO discount! Or visit Concorde�s full network of distributors. For a copy of STC SA01118WI specific to your aircraft, please contact customer-service@concordebattery.com with your Aircraft Make, Model, Tail number, Serial Number and Registered Owner Information (Address, phone, email, phone). Concorde RG® series batteries�.the best in the business�..period! 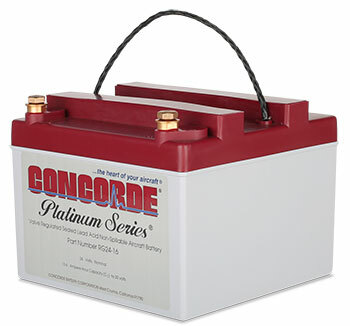 For more information on Concorde batteries from the Concorde web site, please click here.